Shown with Syrup Rack, Squre Syrup bottle, and 1oz Metered pump. Syrup Rack, bottles and pumps not included. This 23 ½” bar mat makes a good drip tray for our 22” Stainless Steel Syrup Rack . 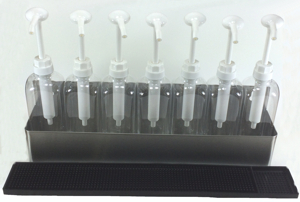 The Syrup Drip Tray will help you save time cleaning the counter after syrup pump use. Any unwanted drips will be caught in the tray, rather than landing on your counter top! When you feel like it’s time to wash your Syrup Drip Tray, simply use soap and warm water. Drip Tray is black in color.